On December 5, The Washington Post (WaPo) said a New York Times (NYT) front page editorial calling for gun confiscation is hurting the gun control cause. 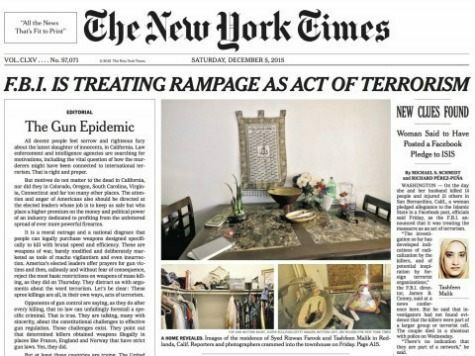 The NYT editorial is written around President Obama’s ongoing narrative against “weapons of war”–i.e., “assault weapons,” which were two of the four weapons Syed Farook and Tashfeen Malik used in their San Bernardino terror attack. It is the first time in nearly a century that the NYT has run an editorial on the front page, and they came out with guns blazing. It is not necessary to debate the particular wording of the Second Amendment. No right is unlimited and immune from reasonable regulation. The Second Amendment is there to protect gun rights from government infringement whether by degrees–via regulation–or all at once–via confiscation. And it is there to protect gun rights from government because the source of those rights is God, not man–i.e., the source is God, not man-made government. AR-15s sold in retail stores are not “combat rifles.” They are simply semiautomatic rifles on an AR platform, and that platform is extremely popular because of the reliability of the gun and the ease with which one can procure parts and accessories. But the left–and particularly the NYT–constantly demonize and ridicule ARs and similar rifles in hopes of securing a ban on them. But the WaPo suggests the NYT has gone too far this time, asserting that the front page call for a gun ban, followed by praise for confiscation, hurts the gun control movement by confirming every gun owner’s worst fear–namely, that all the talk about gun safety and reducing gun violence is just a sham, and the real agenda of the gun control movement is total confiscation. Follow AWR Hawkins on Twitter: @AWR Hawkins. Reach him directly at awrhawkins@breitbart.com.